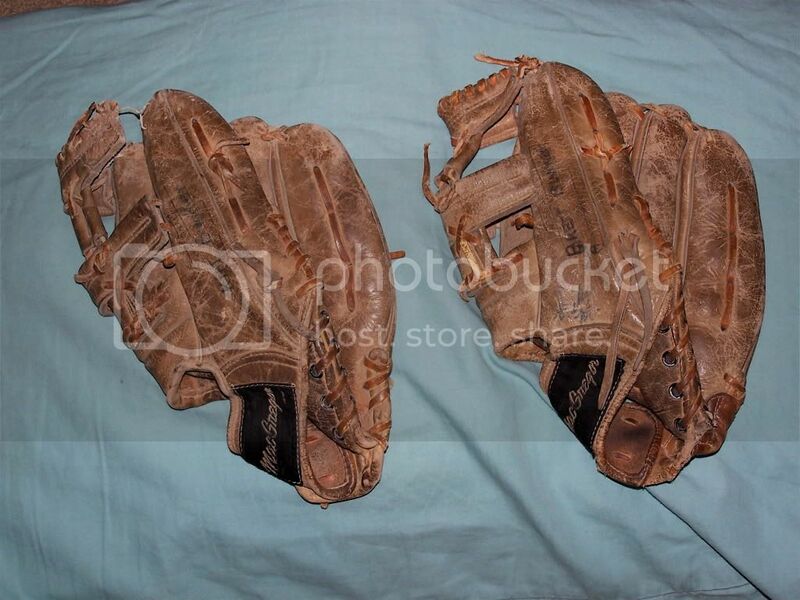 My wife found her brother's old identical gloves they used in little league in the early/mid 70's. Her brothers have not seen these gloves in years, and have probably forgotten all about them. Both have their names written in ink on the outside of thumb. My wife asked me about the possibility of fixing them up with some lace and conditioner, to give to her brothers as Christmas gifts for nostalgic reasons. I don't want to mess this up! I only have Tanners 3/16" lace. What thickness and width do you think I need, and would anyone have some to sell me? I don't want to buy a bundle of 100 from Triple C just for this. Take a look, and I have another question at the last picture. Now this one has a leather patch that was put on for some reason. Obviously, not much I can do to the inner or outer palm areas with this patch on there, and who knows what the damage is underneath. The patch also represents a memory. So do I just leave the palm, including the patch as is, and not even mess with it? Give us the gate key. I have no gate key. Fezzik, tear his arms off. Oh, you mean this gate key! That's a cool idea and something that your wife's brothers are sure to get a kick out of! My brother did something similar for Christmas last year. Unknown to me, while remodeling the garage at my mother's house, he salvaged my 1968 Schwinn Stingray and took it to a guy that restores old bikes. I had gotten the bike on Christmas morning forty years earlier and he presented it to me, looking shiny and new, forty years later. 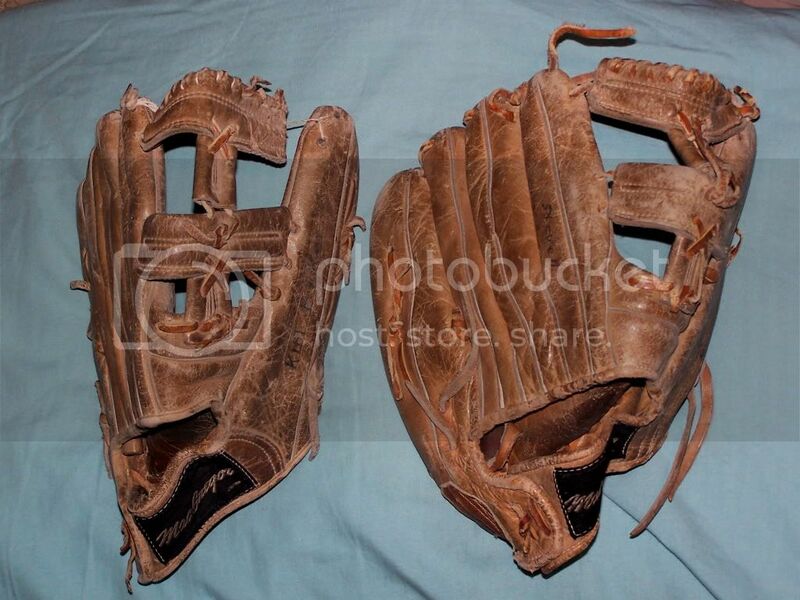 Those two gloves look like they would restore nicely. For the laces, Tanner's would probably work fine, but since they are a little bit thicker than the old laces you would probably have a tough time with the long lace runs that go through the palms, where the lace goes in and out the same holes. If someone here doesn't offer something up, you might want to look for the Rawlings laces that are sold in individual packages in many sporting goods stores. They are quality laces, just a tiny bit less-wide and thinner than the usual Tanner's lace. I have found them to work great in older gloves, where the original laces are thinner than what you find on more modern gloves. As for the homemade patch on the one glove, it's kind of hard to guess without seeing it in person. Maybe after you open up the glove you will be able to see what is underneath it. I would be tempted to leave it in place and "work around" it. That might require changing the lace pattern in that area, depending on what you find. Or, you might be able to punch new holes in it to match the original lace holes, and just run the lace like you normally would. But you are right- that patch might be part of the nostalgia! I don’t think it would it some places. There are parts of the gloves that are so cracked and brittle, I think trying to pull the thick stuff I have through it would just completely shred it. Particularly the top of the webbing- both gloves are really bad. The lace inside the palm and in the webbing is a lot thinner than the stuff I have, while the fingers and outer palm are standard 3/16". 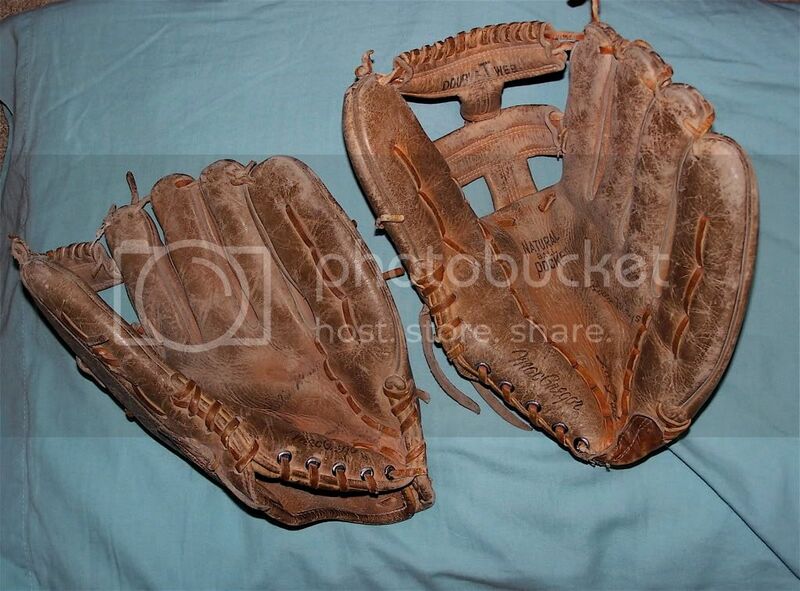 I would recommend that you clean and condition the glove before re-lacing paying special attention to thread holes. I would recommend the lanolin over the Lexol because I believe it to be a more deep conditioner. I usually clean with Lexol Cleaner and condition with Lexol. If this is for nostalgia reasons I would leave the patch. See if you can work around it. You may be able to start lacing it from that end. Use Lexol Orange and give both gloves a good thorough cleaning (inside and out) with a sponge and warm water. Lexol Orange not only deep cleans the glove by lifting the accumulated dirt from the pores of the leather, but it also helps to condition the glove by restoring the natural PH balance to the leather. Be sure to clean off the glove with clear water and a sponge to remove any excess Lexol Orange. After the glove is about 95% dry, follow that up with VPJ to restore the natural softness of the leather. Apply very light coatings of VPJ to the glove and let it sit for 24 hours. If the glove is dry the next day, repeat this process. You might have to do it once, you might have to do it more than once depending on how dry the glove is. The glove leather will accept as much VPJ as it needs, and it will not weigh the glove down like glove oil can do. If the glove has had enough VPJ, you will see it remaining on the surface when you check it after 24 hrs. You can then wipe off the excess with a clean rag. This treatment is especially important for older gloves that are really dried out due to lack of use or lack of proper care. 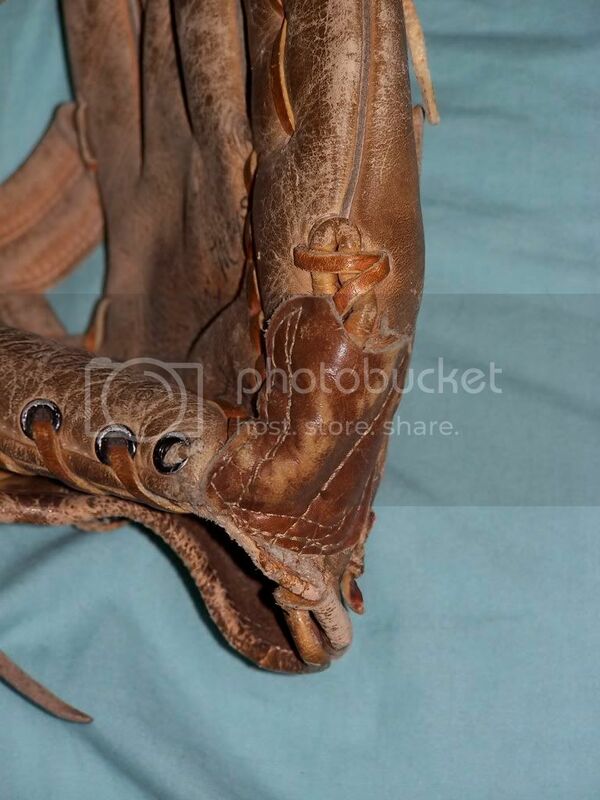 After re-lacing, clean the glove one more time with Lexol Orange, rinse with clear water and let the glove dry. Then use Lexol NF to finish. I've been using this process for a while now and I have been very happy with the results. Again, this is just a suggestion. Other members have tried and true processes that they swear by and it's up to you to consider all of the options and do what you think is best for your particular situation.